Fun and Games — S.T.I.L. Have a little fun with us. It's on the house. 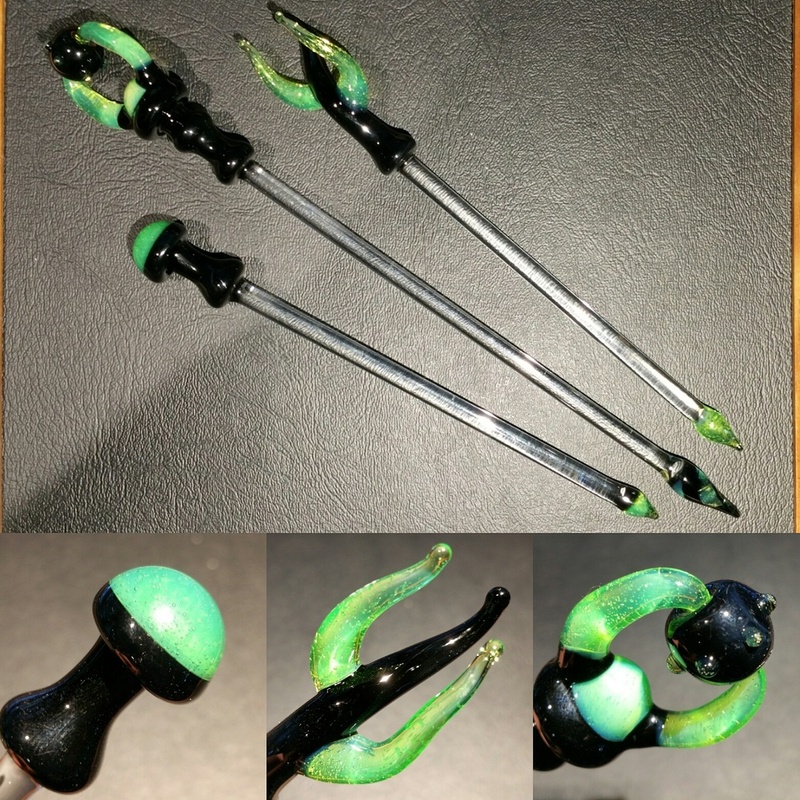 We made these green slyme and onyx black dabbers at our glassblowing studio located at S.T.I.L. on Broadway in Eureka. We are giving them away FREE TREASURE HUNT STYLE. Since these are nicer than previous treasure hunts it will be a little more difficult to find them. Each of the three dabbers will be at a different location. We will take three pictures at each location in order to help you find your prize: a wide shot, a mid distance image, and a close-up of the hiding spot. On Wednesday night we will publish the first set of pictures with one on each outlet. The next night we will rotate accounts and publish the second image. On the last night we will repeat with the final images. You may be able to find the treasures early if you are diligent and lucky. Clue #1 is the wide shot for the spinner! Update: The second picture for this spinner dabber is now posted to our instagram. Act fast, this is the top prize. The wispy Green slyme dabber featured on facebook has already been found! We are keeping it real by adding a new dabber! we will post the wide angle pic of the new item here right now, and add the area specific picture here in the morning. The final detail location picture, if not found, will post on another media account tomorrow night. remember to post a photo and tag us so we can call that hunt off if you find one. This dabber is hidden somewhere within the framed area. The dabber is hidden somewhere within this frame. 11/20/15 Update: This dabber has been found! Only the spinner remains, Good Luck! Good luck and post when you find it! 11/20/15 update: all the dabbers have been found! The final location where @josiah707 found the dabber. It is just above the rock with two holes, planted in the iceplant. The game is now over, thank you to all who participated. I hope you enjoy what we made for you and the adventure getting them. Stay tuned for the next TEamstil treasure hunt! Hidden in plain sight. Right on Broadway near the mall between Applebee's and Taco Bell. You would never know what amazing things await you within. The rabbit hole goes very deep.